Organised & Promoted by Kerry Motor Club Ltd.
Banna Beach Hotel & Resort Mini Stages Rally is promoted and organised by K.M.C. (hereinafter called the promoters), and will cover a route of No more than 90 stage kms. The Competition will be held under the International Sporting Code of the F.I.A. and the General Competition Rules of Motorsport Ireland and these supplementary regulations including Appendixes 25, 29 & 29.1 (Standard Regulations for all Stage Rallies) of the Current Year Book All Competitors who forward completed Entry Forms agree to be bound by the rules. Final Instructions will form an integral part of the Supplementary Regulations. Entries open on publication of the Supplementary Regulations. The Entry Fee for the event is €411 plus €188 Insurance Levy which includes Personal Accident Insurance and Standard IRDS/BRDS Insurance. Cheques may only be post-dated to 1st of November 2017. Cheques should be made payable to Kerry Motor Club. The Club reserves the right to refuse an entry without assigning a reason. The Promoters reserve the right to postpone, cancel, or abandon the event or any part thereof. 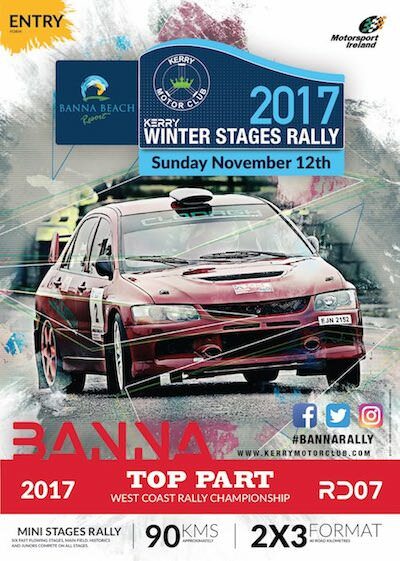 There will be Secure Parc Ferme in operation on Saturday 11th of November 2017 located in Banna. As cars pass mechanical scrutiny they will automatically be sent into Parc Ferme. A starters list will be derived from cars presented at Parc Ferme. The official Notice Board will be situated in the Rally Office will be in operation from 09:00 hrs on Sat 11th November 2017 until 30 minutes after the event prize giving. Prior to the event www.kerrymotorclub.com and www.rally.ie will be updated with information on the rally. Pace notes will be allowed on the event and competitors will be allowed to make notes on Saturday, November 11th, 2017 between 09:30hrs and 16:00hrs. Competitors must sign on at rally headquarters between 9:00 hrs and 12:30 hrs. Pace notes will be available for sale by Third Parties. The club has no involvement in their preparation and accepts no responsibility or liability for their accuracy or otherwise. You will be supplied with reconnaissance identification stickers, which must be placed on the front windscreen when you are commencing your recce/pace note making, where it is clearly visible. “Judges of Fact” will patrol the Stages. Speeding and dangerous driving will be reported to event officials. Respect for residents is essential for the safe running of this event. Your attention is drawn to Appendix “29”, Regulation 4.6.1 &; 4.6.2 The decision of a “Judge of Fact” will be final. Judges of Fact may ask to sign your Road Book. A list of “Judges of Fact” will be posted on the Official Rally Notice Board. Your attention is also drawn to appendix “29”, Regulation 4.8.1 to 4.8.4 referring to a competitor found on a Stage outside of the “Recce” period, also refer to 4.9 – 4.10. Reports of breaches of this regulation will be submitted to Motorsport Ireland who may convene a Tribunal of inquiry. Cameras may be in position before the event. The maximum speed allowed on a Stage during recce is 60 k.p.h. unless a lower limit is indicated by a traffic sign or a written instruction issued by the Organisers. Traversing the Stage in the wrong direction is expressly forbidden and carries a 5-minute penalty. If you are not sure of being clear of any stage by 16:00 you should not start the Stage. The number of runs or part thereof you will be allowed over the Stages is 3 (three) – Penalty for exceeding 3 runs is EXCLUSION. As per Appendix “29” Article 2.6, Motorsport Ireland 2017 Year Book. There will be a designated Service Area. Outside of this Service Area, support/Service is expressly FORBIDDEN and will be monitored by Judges of Fact. The penalty for Service/Support in a forbidden area is EXCLUSION. In an area where service is not permitted the presence of or parking of a support/service vehicle and/or the setting up of equipment will be deemed to be servicing. 10.1.2 A crew retiring from the rally between Parc Ferme Out and Arrival Control SS2, may restart the rally from Service Out Control after 2 stages, or Service Out Control after 4 stages. Cars retiring from the rally on Special Stages 2 or 3, or the following road sections, may only restart from Service Out Control after 4 stages. No restart will be permitted for crews retiring on Special Stages 4, 5, or 6. A restart will not be permitted where a crew has been excluded for non-compliance with eligibility requirements, traffic violations or a decision of the COC/R2C (Rally 2 Co-ordinator). On retirement, the crew must hand in their time cards to Car Accountability or the marshal/timekeeper at the next available location/Time Control. Crews must retain the duplicate copy of the time card, to present to R2C as proof of stages completed. 10.1.3 Competitors must register for Rally 2 if they wish to restart by contacting the R2C prior to a time that will be specified in Final Instructions. Service Vehicles will not be permitted to access the Stage or any closed road between runs. The organisers will, where possible, endeavour to remove any car to the nearest location where it can exit the stage. The transport of the car from that location is the responsibility of the competitor. The car must return by direct route to the Service Area. 10.1.4 Competitors availing of Rally 2 must present themselves at the appropriate Out Control, with their car, for re-scrutiny. Due time is 10 minutes before their original due time at that Control, and 15 Minutes maximum lateness will apply. 10.1.5 The R2C, once satisfied that the crew meets the conditions for a restart, will issue new time cards which will have a restart time and restart Control Number. The restart position within the field shall be at the discretion of the COC/R2C. 10.1.6 The organisers reserve the right to disallow restart on safety grounds or if the restart would interfere with the running of the rally. 10.3.1 In order to be classified as a finisher the crew must complete a minimum of 3 special stages, which must include the final loop of stages and the finish control. 10.3.2 Crews completing the rally under Rally 2 regulations will be eligible to score points in Championships. For further details on requirements for cars in classes 1 – 7 refer to www.fia.com Appendix J articles 252 – 261 (Article 260 refers to cars in Group R) Note: Please consult “Notes on Classes”, Appendix 29, 2017 Yearbook- Standard regs for all Stage Rallies. 09:30 to 16:00 Recce for the event.  Note: The Kerry Motor Club reserves the right to reduce the number of awards for a class or amalgamate classes if insufficient entries are received for any class.